A delegation from the Italian Ministry of Infrastructure and Transport and specialized companies in the ports, transport, construction and infrastructure sectors today paid a visit to the Special Economic Zone in Duqm (SEZD). The visit aimed at viewing the projects being witnessed by Duqm and the available investment opportunities in the zone. The visit included the dry dock, Duqm Port, logistic zone and the areas allocated for the industrial, trade, logistic and housing investments. The visit came as a result for the promotion campaign organized by the Special Economic Zone Authority of Duqm (SEZAD) in the Italian capital, Rome last September during which both sides agreed to organize a visit for the Italian investors and officials to Duqm. The delegation comprised a number of Italian companies specialized in various sectors. Paula Amadi, ambassador of the Italian Republic to the Sultanate stressed the importance of this visit to familiarize the Italian officials and businessmen with the investment opportunities available in Duqm, which will pave the way to increase the Italian investments in the Sultanate. She said that the visit aims at enhancing the trade relations between the Sultanate and Italy and explore the investment opportunities in the Sultanate in general and in Duqm in particular. She pointed out that the volume of inter-trade between the two countries during the past five years grew by 59%. On their turn, a number of Italia investors commended the investment atmosphere in Duqm and the advantages and incentives rendered by SEZAD for the investors. 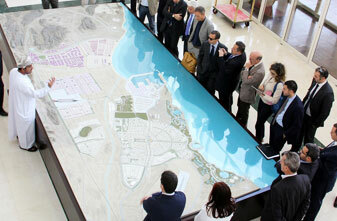 During the visit, visual presentations were given on SEZAD, Dry Dock and Duqm Port.